Henry Holt and Co. (BYR), 9781627792509, 288pp. Two are star-crossed--but three are unscripted in Larry Schwarz and Iva-Marie Palmer's Romeo, Juliet & Jim, book 1 of this YA trilogy. Romeo and Juliet seem to have it all. They are heirs to the two greatest and oldest fashion houses Paris has ever seen, the rival houses of Montague and Capulet. They live in stunning mansions, attend glamorous parties, count celebrities and supermodels among their closest friends. Yet the one thing they want most they can’t have—each other. Juliet is tired of a clandestine relationship. She wants to run off together and escape. Enter Jim, a mysterious American who swoops in and befriends the young lovers. But who is Jim, really? Once Romeo and Juliet find out that their new friend has his own troubling connections within their world, all three of them have a lot to figure out. And with all that's at stake, there's more--Juliet and Jim are falling in love. Can Romeo win back his lover's heart? 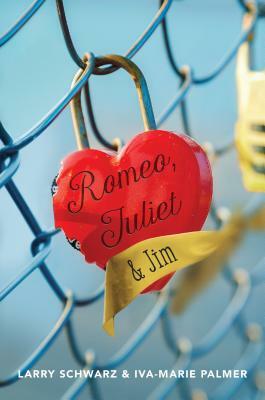 Or will Juliet and Jim rewrite the ending of the world's most famous love story? Larry Schwarz is the producer and creator of many popular television series, including Kappa Mikey, Speed Racer: The Next Generation, and Three Delivery. He is the author of Romeo, Juliet & Jim and lives in New York City. Iva-Marie Palmer is the author of The Summers and The End Of The World As We Know It. She lives in Los Angeles with her family.